The European Federation of Colposcopy was formed 20 years ago with the aim of improving the standards of colposcopy throughout Europe. It is a federation of 34 national colposcopy societies and is uniquely placed to both influence and represent European colposcopists. 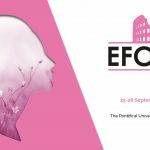 Over this time, in addition to holding large triennial scientific meetings and many European courses, the EFC has developed influential training guidelines and clinical performance quality standards. These have been achieved through effective collaboration and regular focused satellite meetings that have generated a number of published reports and scientific papers. This has included a published recent analysis on the prognostic significant of excision biopsy margins in women being treated for cervical pre-cancer. We want to be able to harness the potential wealth of information and clinical data that our members has access to in order to tackle important clinical questions and improve the care of woman in cervical screening programs. As in previous years, the focus of the scientific programme will be on state of the art presentations in our field as well as new insights into impact of HPV immunization on colposcopy, management of cervical cancer, colposcopic technologies and management of colposcopic problem. Also on 25th and 26th will take place the 34th Congress of the Italian Society of Colposcopy, and will be preceded by a Training the Trainers Course and Basic Colposcopy course.